The Queen received a rapturous welcome in York today as she prepared to hand out the traditional Royal Maundy money to pensioners from all over Britain to mark her Diamond Jubilee. Dressed in an aquamarine and grey tweed overcoat and aquamarine hat, the Queen had to touch a ceremonial sword and mace before passing through the 12th century gateway to the walled city, Micklegate Bar. The Queen was given the time-honoured Monarch’s welcome to the city in a medieval atmosphere conjured up by traditional musicians and musketeers. She met the Lord Mayor David Horton and the town clerk, Kersten England, read out a proclamation of welcome. Usually, the Maundy money is given to pensioners from one diocese each year. But this year, 86 women and 86 men - one for each of the Queen’s 86 years - will receive the money in recognition of their services to the Church and their communities. The Royal Maundy ceremony traces its origins to the Last Supper when, as St John recorded, Jesus washed the feet of his disciples. The royal party arrived at York Minster in bright sunshine cheered on by thousands of well-wishers. The distribution of Maundy money is associated with the ceremony held on the Thursday before Good Friday which remembers Christ washing the disciples feet before the last supper. At the end of the meal Christ gave them a new commandment ..... “to love one another”. The word maundy is derived from the Latin “mandatum” which means command. The tradition started with the monarch giving out food, clothing and wine. The first recorded instance of the monarch giving out Maundy money was in Rochester in 1213 when King John gave 13 pence to 13 poor men. In the early days the reigning monarch washed the feet of the poor in imitation of Christ’s actions. This became less frequent in the 17th century with the outbreak of the plague, when the monarchs used to get people to deputise for them if there was any sign of possible health hazards. The washing of feet was discontinued by the 18th century. The commandment, or mandatum, ‘that ye love one another’ (John XIII 34) is still recalled regularly by Christian churches throughout the world and the ceremony of washing the feet of the poor which was accompanied by gifts of food and clothing, can be traced back to the fourth century. Henry IV began the practice of relating the number of recipients of gifts to the sovereign’s age, and as it became the custom of the sovereign to perform the ceremony, the event became known as the Royal Maundy. The red purse will contain a £5 coin commemorating The Queen’s Diamond Jubilee, and a newly minted 50p coin. 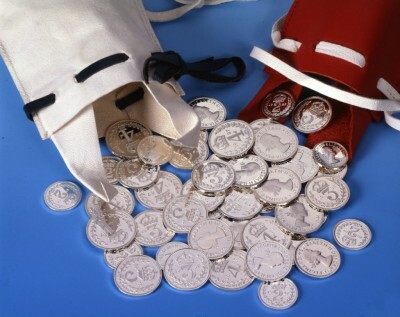 The white purse will contain uniquely minted Maundy Money of silver one, two, three and four penny pieces, the sum of which equals the Queen’s age. Although all the coins are legal tender, they are minted of sterling silver (92.5% pure) and are not for general circulation. Following the prayers and singing of the national anthem, the processions moved through the Minster to exit as music by Bach was played. The royal party was greeted with rapturous applause and cheering as they emerged on to the steps of the Minster.